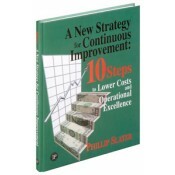 Developed from the author's own practical experience, this unique resource details a proven, 10-step approach to cost reduction, and provides a series of tools to help you achieve sustainable cost reduction in your business while avoiding the damage of “slash and burn”. A New Strategy for Continuous Improvement presents a new ‘Operations Improvement Cycle'. This cycle provides the benchmark, priority and guidance that were missing in the original cycle. This is achieved through a three stage process involving 10 specific steps. Additionally, it explores the issues with the traditional approach to continuous improvement and cost reduction and then takes you through the three stages and the '10 Steps' in detail. Working with this manual will change your approach to cost reduction forever. Not only will you save money on an ongoing basis, but these proven techniques will have an impact almost immediately! Explains the steps to lower cost reduction, how to apply them, and in what order. Includes 47 specific 'must do' actions for success. Details the 42 common mistakes people make. Discusses how implementation is a process, not just an entry on a Gantt chart. Contains 24 templates to help guide you through the entire process. Provides 20 case studies that can be applied to any business.